Allow me to do some history of archaeology: in 1984 and jointly with Jaime Litvak King, we organized a congress that gathered at the UNAM, Mexico, with the purpose of paying an homage to Ignacio Bernal, called The History of Archaeology in Mexico. In that occasion my paper raised heated controversies, as it revised the origins of stratigraphy in Mexico, a country in which the image of Manuel Gamio was highly respected and admired, while William Holmes, in those days, happened to be a perfect nobody. 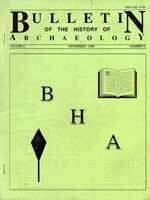 In 1986, an English version of that paper was presented at the First World Archaeological Congress of Southampton. In the meantime, Gordon Willey sent me a letter telling me about his interest for my re-discovery of Holmes’ work in Mexico. I wrote back to him with additional information, which he used to complete a review he was in the process of writing (Willey 1994) on David J. Meltzer and Robert C. Dunnell’s book about Holmes (1992). He also wrote about how excited he was for my having pointed to the French Scientific Mission in Mexico (1864/7) as those who initiated scientific archaeology in Mexico and as the first to introduce the notions of applying certain special techniques for excavation, as was that of respecting the stratigraphic layers (Schavelzon 1994). Therefore, and in view of the ongoing and significant contributions about the origins of stratigraphy in our continent (Browman and Givens 1996; Browman 1997, Warren and Rose 1994), perhaps it could be interesting that my above mentioned paper is published, as it reflects a different way of considering the same issue. And perhaps now more than before, at a time when in Alain Schnapp’s last book (1997) stratigraphy has been traced as early as 1697 in Olof Dudbeck, when he established the relationship between sedimentation, historical chronology and layers. What follows is the final, unpublished version of that 15-year old paper. Writing about the history of stratigraphy as a scientific method has not to do merely with the curiosity of knowing “who did it first”; in fact, the issue has been so often discussed because the intention is to try to understand stratigraphy as the scientific method of a science that was in the process of being born at the turn of the 20th century. In fact, the issue we are now revising is the significance of the new scientific paradigm that exploded throughout the continent by the end of the century, one that replaced the French Americanism with that of the new museums and professional institutions. That is why, to understand the situation, it is also necessary to understand the evolution of the notion of the eventual existence of a scientific method, applied in the excavations carried out -by researchers of different countries, including some Latin American scientists- throughout the 19th century. And to understand this process it is necessary to take a look, if only slightly, at the context of those days. In previous years, the origin of the stratigraphic method has been attributed to the pioneer work of Manuel Gamio, in Mexico (Adams 1960, Matos 1972) and even in the entire Latin American territory (Strug 1971); other historians would point to Nels C. Nelson (Woodbury 1960a, 1960b) and still others pointed to Frans Boas (Mark 1980); also, some short references were made to William H. Holmes (Willey and Sabloff 1973, Bernal 1979) and to Max Uhle (Rowe 1954, Linares Málaga 1964). In Latin America, stratigraphy had its origins in two well defined stages: that of the stratigraphic observations and that of the excavations themselves, by following the method of either the artificial or the natural layers. Between the two stages lies the confusing period I want to discuss. The first stage is featured by the observation and the establishment of temporality relations between the stratigraphy observed and the objects each layer contained. This phenomenon had been extensively used by geologists and anthropologists concerned with the “prehistoric man” in the whole world, including Latin America: Florentino Ameghino used it since the decade of 1870’s, and in Europe it was common a quarter of a century before that. But it would seem that the passage of one field of knowledge to the other was not that simple, in spite of being so close from one another, and in spite of the fact that particularly in France, the same scientists would work both with the “prehistoric man” and an archaeology of more recent times. In Mexico, one of the oldest observations is the one recorded by Henri Baradére (1834) when he reported the findings occurred at different depths in the book Antiquités Mexicaines by Dupaix and Castañeda. There is a later observation made by Captain Soyer, when he described the findings of an artesian well (1865); the article was rescued by Ernest Hamy and published again (1902). In 1864, the members of the Commission Scientifique Francaise brought to Mexico a whole set of new ideas, as for instance the still misty relationship that existed between layers-contents-temporality. The Comisión Científica de Pachuca, a branch of the French scientific commission, was the one to initiate the application of the method, during the excavations carried out in Teotihuacan (Almaraz 1865) conducted by one of the greatest scientists of those days: Antonio García Cubas, a geographer and a naturalist. As a consequence of that experience, he performed many other excavations, including a second work on the field in Teotihuacan, in 1895. On June 9, 1865, García Cubas wrote that for the excavation of the mounds he laid out trenches or “ditches” along the old construction, observing each layer and clearing them one by one. The excavator did not appropriate himself of this novelty but instead, he said he was told to work in such a manner by “more clever and respectable gentlemen”. Who they were, he does not say, but we should keep in mind that the Comisión Científica de Pachuca had been created as the local branch of the French scientific commission, who funded the works they carried out and the publication of the results thereof (Schavelzon 1994). Undoubtedly, this was the first scientific survey of an archaeological site, one that introduced, among other original techniques, the drawing of maps using a theodolite, the longitudinal cut of the entire site -topography included-, and the advanced hypothesis that connected the superimposition of buildings with chronology. The latter point took half a century before it was accepted. But the fall of the Commission following the defeat of the French army in 1867 and the permanent criticisms that for a long time the scientists had been enduring -as they were considered collaborators of the French intruders – did not allow for the publication of the detailed studies carried out during these excavations. In the years that followed, that which García Cubas had done was repeated by other excavators in Mexico: when in 1883 Auguste Le Plongeon explored the Platform of the Eagles in Chichen Itza he applied stratigraphic techniques, although he never published the information obtained (Desmond 1981). The superimpositon of buildings, seemingly so closely related to the concept of the stratigraphic sequence, was sensed by George B. Gordon in Playa de los Muertos, Honduras, when he worked for the Peabody Museum (1898), but after he passed away, the issue was inadverted among his many articles; at that time he made the attempt to demonstrate that the Hieroglyphic Stairway in Copan was an example of temporal sequence rather than a bizarre constructive system, as it was generally considered. It is not by accident that the first ceramic stratigraphy in the Maya zone was accomplished by Alfred Tozzer and Raymond Merwin, who presented an interesting interpretation of the constructive sequence of buildings, one that was studied after 1909 and published much later (Tozzer and Vaillant 1932); Tozzer also published the results of his works in Holmul (1910), carried out by means of the same technique. I shall later refer to the relationship between Tozzer and Gamio. In South America, most authors agree in pointing to Max Uhle as the introducer of this method, while he was said to have taken the idea from his teachers, the geologists Wilhem Reiss and Alphons Stubel, who in 1880 had made some relevant observations in Paracas and other Peruvian sites (Reiss and Stubel 1880/87; Uhle and Stubel 1892). Uhle’s work in Pachacamac in 1896 constitutes the beginning of the use of the method in South America, and following the corresponding publication (1906) the method began to be more widely known. Between 1905 and 1910 several works that included the description of the cultural contents of the different layers and the conclusions thereof were published in the region (Ambrosetti 1906, Boman 1914, Torres 1907 and 1910). The end of the period of the stratigraphic observation, was signalled by a work carried out by William H. Holmes in 1884. Holmes already had an experience as a geologist and in drawing, and had accomplished several extended exploration trips across the United States (Leary 1916). By the end of 1883 he married Kate Clifton Osgood, and for the honeymoon they planned a trip to Mexico with some other people, in a wagon they had for themselves in a train rented to that purpose. For two months they remained at the Central Mexican Railroad Station -presently Buenavista- where Holmes wrote several articles: two of them had to do with archaeological forgeries (1882 and 1889), another one with the monumental sculpture of Teotihuacan (1885b) and there was another one with his studies about the stratigraphy of the Valley of Mexico (1885a). In the following years he kept writing about Mesoamerica, and the trip he made in 1895 through Yucatan and Oaxaca provided him with the tools to write one of the most significant books on American archaeology, namely, Archaeological Studies Among the Ancient Cities of Mexico (1895/97). Later, in 1916, he would return with Samuel Lothrop and Sylvanus Morley. Years later, Manuel Gamio ignored Holmes works, and we presume that his trip of 1895 might have had something to do with Gamio’s attitude. Holmes’ article about stratigraphy was written in Washington shortly after his return from Mexico and was published under the title of Evidences of the Antiquity of Man on the Site of the City of Mexico, in the Transactions of the Anthropological Society (1885a), a magazine that was periodically received in Mexico. The author explained that he had visited the National Museum, whose collection, of an outstanding esthetic value, lacked the necessary references as to the precise origins and antiquity of the objects. Therefore, he made the decision to cast some light on the situation by means of observations he would initiate in the surroundings of the train station, a zone that not only was rich in surface earthenware fragments, but where the ditches dug to obtain blocks of mud to manufacture clay bricks, were several meters deep. Holmes selected a ditch with dimensions of 30 meters long and 2.40 meters deep, in which, according to his statements “the layers remained untouched since the day they were deposited”. He made a drawing of the profile, of the contents, and of “their mutual relationship”. The profile presented two major strata which showed in turn a number of differences in the interior; consequently, Holmes analyzed the ceramic fragments from each layer without mixing them, and then he established comparisons between both groups. Also, he compared them with the National Museum’s collection, among others he checked as well. The first results obtained pointed to the existence of two major periods, with two subperiods each: the Archaic one -as he named the oldest one- and its archaic ceramic evidences of a long and extended occupation. A second subperiod corresponded to a pan-Mesoamerican stratum possibly related with Cholula, one he called Intermediate. As to the Upper period, the first stage was featured by its similarities with objects originated in Teotihuacan and with the orange ceramic found in Texcoco, Texcotzingo and Cholula. The final stage was the so-called Aztec, the most widely known in those days. In the corresponding stratum, remains of huts, obsidian and stone implements were found. Similarly, Holmes carried out a very simple analysis of the ornamental motifs of the ceramics. The concept of an Archaic period, in addition, took thirty years to be properly defined (Willey 1981). So Holmes was advancing that which the International School would propose twenty-five years later as the cultural sequence of the Valley and the possible existence of an Archaic culture, something that Manuel Gamio would only prove in 1911, with his excavations at Atzcapotzalco (1913). And this is of no secondary importance: that which Holmes observed were two major layers with two subdivisions each, thus making a total of four; on the contrary, Gamio saw only three periods, which were taken as the basis for the chronology of the Valley of Mexico up to the decade of the 1940’s, when the excavations carried out in Tula finally proved the existence of a fourth, Toltec stage. Holmes had associated his post-Teotihuacan and pre-Aztec stages with Cholula rather than with Tula, as this one had not even been discovered. His observations resulted more accurate than the excavations of the International School. No doubt it was Gamio who institutionalized the method of artificial stratigraphic excavation in Mexico, but he never said a word to indicate that such ideas were not new. Only several years later he mentioned Holmes in the footnote of an article; this leads us to the questions of whether Gamio was familiar with Holmes’ work, and if so, why he ignored him. This is only a speculation, but anyway, it shows the complexities of the period and the existing situation of the struggle in which different groups were engaged, in the pursuit of academic preeminence, during the years of the Mexican Revolution. First, we must keep in mind that Gamio was in debt with Frans Boas, for his professional career in the United States. He was his indisputable disciple and the major divulger of his ideas. But simultaneously, Boas was a friend and collaborator of Frederick Putnam’s, the most renowned personality in the U.S. anthropology. And Putnam was an unreconcilable opponent of Wiliam Holmes. The controversies between these two giants have filled countless books, and it must have been out of the question, then, at a time and in a situation that led to an open confrontation between Harvard and Washington, to openly accept that Holmes was the creator of such an important development, one that was crucial for the type of archaeology Gamio was proposing. Today it is possible to consider Holmes as the man who developed stratigraphy in the United States (Willey and Sabloff 1974), and today we can assume that his work in Mexico must have helped him in his endeavors; but back in those days Putnam claimed those credits for himself, based on his excavations at the Trenton quarries. The situation was so tense that the incorporation of Sylvanus Morley -a friend of Holmes’- to the Carnegie Institution prevented that institution from doing archaeology in Mexico until 1923. In 1936 the animosity had not calmed down, and Boas, a scholar with an indisputable prestige would state the following: “It is true that I have done little archaeological work on my own. My only contribution has been to establish the sequence of the Archaic, Teothuacan and Aztec types in Mexico; I think this was, with the exception of Dall’s studies in the Aleutians, the first stratigraphical work ever carried out in North America” (Mark 1981). And there was one more thing that contributed to encourage Gamio’s attitude for disapproving Holmes: the relationship Holmes had with Allison Armour, a tycoon in the meat industry and the friend who brought along Holmes to his trip across the Yucatán in 1894; Edward Thompson, the U.S. consul -and one of Gamio’s major opponents-, associated to Leopoldo Batres -Gamio’s predecessor in his position as Monuments Inspector and a member of Porfirio Díaz’s intelligenzia-, was also a member of the party. Gamio represented the new Revolution, while Thompson and Batres represented the times of Porfirio Díaz and the dictatorship. Thompson was also the representative of Harvester and Co., a company that monopolized the sisal production in Yucatan and one that has been repeatedly pointed as the accomplice and promoter of the exploitation of thousands of Maya indians, and the use of slaves, up to 1880. Thompson had been sponsored by Putnam -an open adversary of Boas’, Gamio’s mentor- to excavate in Chichen Itza. Sylvanus Morely was forced to publish an article in the United States criticizing Batres, to obtain Gamio’s authorization to work in Mexico. And moreover, to excavate in Chichen Itza he was forced to put an end to his relationship with Thompson, who was tried, separated from his position and sentenced by a court of law. Gamio had been fighting for the appointment of Monuments Inspector since 1910, and in 1913 he finally won in the competition with Francisco Rodríguez, one of Batres’ successors. It was more or less in that period when the question of the stratigraphic excavations was institutionalized: Tozzer submitted his research on Maya ceramics, and in 1913 -the same year when Gamio published the results of his excavations in Azcapotzalco-, Tozzer excavated and published his work in San Miguel Ahuizotla. There, he conducted a research on the superimposition of architecture, which was a model for subsequent studies on prehispanic architecture. At the International School, which Tozzer had helped founding, the issue of the cultural sequence of the Valley of Mexico became -following Boas’ initiatives- the main subject; the very significant support of a geologist who also worked in archaeology was of great help: his name was Jorge Engerrand (1913), and his works are still waiting for a detailed study. Boas encouraged Gamio to excavate stratigraphically -an important achievement- and to establish an accurate chronology; but ironically, as it sometimes happens in history, Holmes’ was more complete. And Antonio García Cubas was totally forgotten, even though, by then, he was still alive. However, by 1920 Gamio made the attempt to clarify the situation: he tried to separate the development of the stratigraphical method in itself from the discovery of the so-called Archaic Culture. And perhaps this is the core of a portion of the problem in this controversial attribution of achievements. Gamio initiated his article quoting Holmes’article of 1885, subsequently indicating that other similar discoveries had been accomplished by Zelia Nuttal, Herbert Spinden, Frans Boas, Eduard Seler and G. Niven. He pointed out that it was Boas who suggested him to keep working on the sequence and that it was him who should be credited for the first description of the Archaic ceramic type. Gordon Willey has already discussed this subject when he referred to Spinden (Willey 1981); but Gamio’s timely reference to Holmes did not change things; in fact, it represented nothing more than a much delayed acknowledgement of the antecedents. This period comes to an end with the diffusion of the artificial stratigraphic method made by Gamio, institutionalized by his excavations in Teotihucan. There’s no question about that credit; but it still was Holmes the one that applied the method in an observation for the very first time, and the one that with such an observation developed, for the first time, the scientific reconstruction of the cultural process of the Valley of Mexico; besides, his conclusions have lasted a whole century and for the most part are still in force. On the other side, García Cubas must be similarly credited, as he did exactly the same, but excavating, long before that. 1960 “Manuel Gamio and the stratigraphic excavation”, American Antiquity, Vol. 26, pp. 99. 1865 “Apuntes sobre las pirámides de San Juan Teotihuacan”, Memorias de los trabajos ejecutados por la Comisión Científica de Pachuca en el año 1864pp. 349-358, Imprenta de J.M. Andrade y F. Escalante, México. 1906 “Exploraciones arqueológicas en Pampa Grande, Provincia de Salta”, Revista de la Universidad de Buenos Aires, vol. 6, No. 1, Buenos Aires. 1834, “Note sur la découverte de potteries antiques á divers profondeurs”, Antiquités Méxicaines, vol. I, Paris. 1952 “La arqueología mexicana de 1880 a la fecha”, Cuadernos Americanos LXV, No. 5, pp. 121-145, Mexico. 1979 Historia de la Arqueología en México, Porrúa, México. 1981 The Excavations by Auguste Le Plongeon of the Platform of Venus, Chichen Itza, Yucatan, Mexico, 1883, Paper presented to in the Annual Meeting, Society for American Archaeology. 1913 “Discurso inaugural a la Exposición de la Escuela Internacional de Arqueología y Etnología Americanas”, Boletín del Museo Nacional de México, 2a Epoca, vol. I, pp. 263-265, Mexico. 1913a “Arqueología de Azcapotzalco, D.F., México”, Proceedings of the XVIII International Congress of Americanists, pp. 180-187, London. 1913b “Los prejuicios en arqueología y etnografía”, Anales del Museo Nacional, 3a Epoca, vol. V, pp. 153-160, Mexico. 1920 “Las excavaciones del Pedregal de San Ángel y la cultura arcaica del Valle de Mexico”, American Anthropologist, vol. 22, No. 2, pp. 127-143, Lancaster. 1959 “Boas: sobre cerámica y estratigrafía”, The Anthropology of Franz Boas, pp. 117-118, Memoirs of the Anthropological Association, No. 89, Menasha. 1898 “Researches in the Uloa Valley, Honduras”, Memoirs of the Peabody Museum of Archaeology and Ethnology, vol. I, No. 4, Cambridge. 1902 “Le petit vase á figure Humaine du puits artésiens de Santiago Tlatelolco”, Journal de la Société des Américanistes, vol. VI, pp. 119-122, Paris. 1882 “A Trade in Spurious Mexican Antiquities”, Science, vol. VII, pp. 170-172. 1885a “Evidences of the Antiquity of Man on the Site of the City of Mexico”, Transactions of the Anthropological Society of Washington, vol. III, pp. 68-81. 1885b “The Monoliths of San Juan Teotihuacan”, American Journal of Archaeology, vol. I, pp. 361-371. 1889 “On Some Spurious Mexican Antiquities and their Relation to Ancient Art”, Annual Report, Smithsonian Institution, pp. 319-334. 1895/97 Archaeological Studies Among the Ancient Cities of Mexico, Field Columbian Museum, Chicago. 1964 El antropólogo alemán Frederich Max Uhle, padre de la arqueología peruana, Edición del Autor, Arequipa. 1981 Four Anthropologists: an American Science in its Early Years, Science History Publications, New York. 1972 Manuel Gamio: arqueología e indigenismo, Sepsetentas, Mexico. 1877 “Las pirámides de Teotihuacan”, Anales del Museo Nacional, 1a. Época, vol. I, pp. 186-195, Mexico. 1880-1887 The Necropolis of Ancon, Peru, 3 vols., Berlin. 1954 Max Uhle, 1856-1944, a Memoir of the Father of Peruvian Archaeology, University of California Press, Berkeley. 1984 Holmes y el origen de la estratigrafía científica en México, paper presented at the Conference on History of Archaeology in Mexico, UNAM, Mexico. 1986 Origins of Archaeological Stratigraphy in Latin America, A Critical Review, paper presented in the 1st World Archaeological Congress, Southampton. 1865 “Rapport sur les puits artésiens de Santiago”, Archives de la Comission Scientifique, vol. I, pp. 438-446, Paris. 1971 “Manuel Gamio, la Escuela Internacional y el origen de las excavaciones estratigráficas en las Américas”, América Indígena, vol. XXXI, No. 4, Mexico. 1907 “Arqueología de la Cuenca del Río Paraná”, Revista del Museo de La Plata, vol. 14, pp. 53-122, La Plata. 1911 Los primitivos habitantes del Delta del Paraná, Universidad de La Plata, Biblioteca Centenaria, La Plata. 1911 A preliminary Study of the Prehistoric Ruins of Tikal, Guatemala, Memoirs of the Peabody Museum, vol. V, no. 2, pp. 93-135, Cambridge. 1932 The Ruins of Holmul, Guatemala, Peabody Museum, Memoirs, vol. III, no. 2, Cambridge. 1903 Pachacamac, Report of the William Pepper Peruvian Expedition of 1896, University of Pennsylvania, Philadelphia. 1892 Die Ruinenstaette von Tiahuanaco in Hochlände des Alten Peru, Leipzig. 1974 A History of American Archaeology, Freeman and Co., San Francisco. 1960a “Nels C. Nelson and Chronological Archaeology”, American Antiquity, vol. 25, No. 3, pp. 400-401. 1960b “Nelson’s Stratigraphy”, American Antiquity, vol. 26, No. 1, pp. 98-99. Anthropologist, vol. 98, No. 1, pp. 80-95. 1997 “An Appreciation of Claude Warren and Susan Rode’s William Pengelly’s Techniques of Archaeological Excavation”, Bulletin of the History of Archaeology, vol. 7, No. 2, pp. 31-33. 1994 “La arqueología del imperialismo: la invasión francesa a México (1864-1867)”, Mesoamerica, vol. 28, pp. 322-335, South Woodstock. 1997 The Discovery of the Past, Harry N. Abrams, Publ., New York. 1994 William Pengelly’s Techniques of Archaeological Excavation, Torquay Natural Society Publ. No. 5, Torquay. 1994 “The archaeology of William Henry Holmes” (review of David J. Meltzer and Robert C. Dunnell), Journal of Field Archaeology, vol. 21, p. 119-123.